The American election turned political campaigning on its head. Canadian politicians better heed the lessons. There is a well known theory in political campaigning: The candidate who raises the most money and spends more is likely to win. This seems logical. Money can buy solutions to most campaign problems: a first time candidate can pay experienced staffers for assistance, an unknown candidate can buy signs and ads to increase name recognition, and a candidate with no volunteers can pay canvassers. American elections are the pinnacle of campaign fundraising and spending. These past couple months have been no exception. In fact, this election could be heralded as the example. The Trump-Clinton showdown is estimated to cost more than any other election in American history. But all things were not equal. Throughout the campaign, Hillary Clinton consistently out fundraised and outspent Donald Trump. Like, badly. In early summer, the Trump campaign’s fundraising and spending totalled a mere 24 per cent of Clinton’s campaign. By the end of July, as the candidates were confirmed by their respective parties, that gap began to narrow — but not by much. By his own admission, part of the beauty of Trump is that he is very rich, yet his campaign figures never could catch up to Clinton’s. In August, Trump raised 71 per cent of what Clinton had brought in and spent only 49 per cent compared to his opponent. In September, Trump raised 56 per cent of what Clinton’s campaign did, and spent 40 per cent. And by the end of October, the GOP raised 63 per cent of the amount the Dems did, and were spending 65 per cent comparably. All accounted for (including Super PAC contributions), the Trump campaign raised and spent less than half of Clinton’s campaign. We all know what happened next. In this case, the candidate who raised and spent the most money (two times as much!) did not win. In the world of political campaigning, that is a huge upset. This is not isolated to politicians south of the 49th parallel. While Trudeau’s Liberals did outspend the Conservatives during last year’s federal election, many local candidates touted their large war chests in vain. Of the top 50 big-spender MP candidates, only 19 made it to office. Of course, “big-spenders” in federal politics, where there are rules governing political donations, are incomparable to the politicians in B.C. There are no rules governing donations in our province. Politicians can, and do, solicit unlimited amounts of donations from corporations, unions and wealthy people all over the world. It is worth pointing out that while American election laws appear to operate with no holds barred, they are actually more protective of their democracy than B.C. when it comes to outsiders trying to buy influence within their government. Foreign nationals cannot donate to American political parties, but British Columbian politicians not only welcome foreign donations, they actively seek them out. There is another common idea in campaigning: A politician would rather have $1 from 1,000 people than $1,000 from one person. Why? Because at the end of the writ, it comes down to one thing: votes. No matter how much money you or your company has, you only get one vote (if you are a citizen, of course). We are all equal in the eyes of democracy. And yes, we could talk about the U.S. Electoral College and the popular vote results, as well as the debate in our own backyard about proportional representation, but from the rise of Bernie Sanders to the success of Trump, the U.S. election has taught us an important lesson and it shouldn’t be underestimated. The old way of doing politics is out. Corporations with deep pockets are losing control and grassroots citizens are taking back democracy. As the leader of a party that consistently out-fundraises and outspends their competition, Premier Clark should be getting nervous. There are too many similarities between her public image and Secretary Clinton’s. Given the growing political movement, the BC NDP can no longer justify the argument that they need to meet the BC Liberals dollar for dollar to be competitive. Going into the 2017 provincial election, B.C. 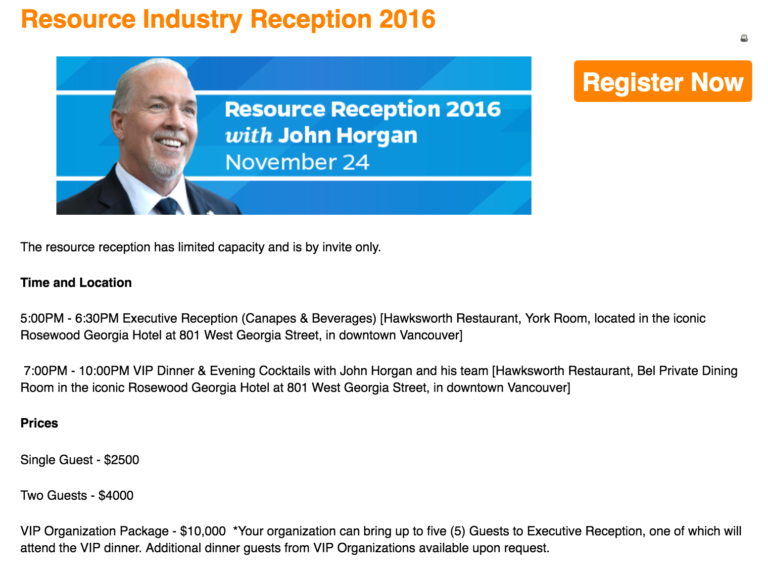 politicians continue to attend cash-for-access events with industry bigwigs, some who aren’t even a part of the electorate. Meanwhile, Dogwood is continuing to organize voters. The more people who get out to the polls, the more apparent it will be just how ineffective corporate dollars have become. Because on election day, votes are all that matter. Yeah, apparently money can’t buy an end to misogyny. Clinton had to fight two old white dude bullies that demeaned her, attacked her credibility, and ignored her far superior qualifications — Sanders *and* Trump. Of course she didn’t have enough money for that. If corporations were losing control, Trump would have lost. Don’t buy the rhetoric that he is the rogue outsider, far from it. He’s only rogue as a civil human, but he’s the massive corporate shill that the world was sure Hillary was, just look at his appointments so far. Be careful what you wish for, Canada.